The Inter-Ministerial Group (IMG) on the allocation of coal blocks headed by Additional Secretary, Coal, Zohra Chatterji, is expected to recommend the de-allocation of about 12 blocks which have not been developed at all. The UPA government was again in the firing line with the BJP today demanding an enquiry into the latest reports on coal block allocations while Coal Minister Sriprakash Jaiswal was the target of attack by the ruling combine�s ally, the Samajwadi Party, for the first time since the controversy erupted. 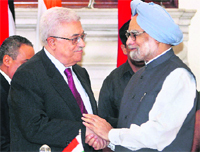 Reiterating New Delhi�s support for Palestine�s bid for full and equal membership of the United Nations, Prime Minister Manmohan Singh today announced that India would contribute $10 million to Palestine�s budget for this year to help address its financial requirements. The Punjab and Haryana High Court on Tuesday quashed the appointment of 1,983 physical training instructors (PTIs) by the Haryana Staff Selection Commission, ruling that it was �a one man show�. The police has registered an FIR against two Army officers and some �unidentified� soldiers for allegedly attacking policemen and ransacking the GRP police station at the Kathua railway station on Monday. The judicial custody of former Haryana Minister Gopal Goyal Kanda and his aide Aruna Chaddha was today extended for 14 days by a Rohini court in the Geetika Sharma suicide case. The proceedings were conducted through video-conferencing. Alarmed over massive inflow of narcotic drugs into Punjab in recent years, police officers from three states today decided to share information every fortnight and cut supply and escape routes of narcotic smugglers on the run. The Amritsar-Chandigarh Superfast Express linking the holy city, Jalandhar and Ludhiana to the state capital chugged out of Amritsar railway station on its maiden journey today � its graffiti-like colours unchanged and boards still pronouncing it as Duranto. In all, 347 passengers travelled from Amritsar, Jalandhar and Ludhiana to Chandigarh on Day 1.